Winter blues got you down? Cheer up with these delicious Cape May dinner recipes. These outstanding meals courtesy of the Food Network – are sure to keep your spirits up all winter long. Warm up with this delicious spaghetti recipe made with a creamy egg and Parmesan cheese sauce. The eggs cook as the mixture is combined with the hot pasta. Pro tip: to thin the sauce, add a little leftover pasta water. This tomato bisque is anything but boring. Use heavy cream, minced bacon and spices to transform a can of tomatoes into a silky soup. This recipe comes from the Portuguese community of Mystic, Connecticut. Thanks to Rachel Ray it’s been simplified a little so it’s quicker to make – but just as delicious. Spinach-turkey meatballs in a provolone cheese sauce? Yes please. Try this recipe for a delicious take on meatball night that only take 30 minutes to make. Nothing warms the body like curry. And, even the pickiest of eaters will love this recipe packed with vegetables. Pro tip: add extra broccoli and carrots to bulk up the curry and make it last longer. This soup combines cannellini beans with beef broth to make a cream, hearty soup. The secret weapon in this unassuming recipe? A frozen Parmesan rind. As it melts it adds a salty, buttery flavor to the soup. It’s no surprise that this yummy soup is packed vitamins and nutrients – things we all need this time of year. Pro tip: To add more fiber and make any vegetable soup more filling, add a can of organic beans. We promise, this risotto recipe won’t keep you in the kitchen all night long. It’s an ideal shortcut for any risotto-lover in the mood for a cheesy vegetarian dish. This combo is no joke. Baked potatoes with blue cheese, sour cream and chopped herbs are the perfect partner in this traditional steak meal. This recipe pairs fresh bell pepper and carrot slaw with a quick and easy carne asada for a warm weeknight special. For the salad lover, this layered blend mixes winter’s best vegetables with tender-chewy barley, brown rice or quinoa, for a super filling and healthy entre. Harry’s Ocean Bar and Grille is open seasonally from, spring through fall. 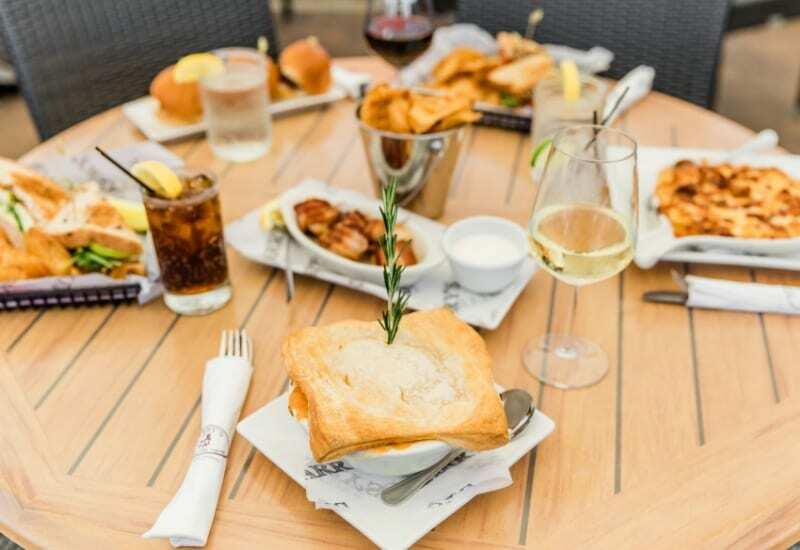 Visit us for delicious food and drink, live music and breathtaking ocean views all summer long.